Dewdrop Dolls & Stories is a company that sells doll/story kits designed to bring adults and kids together around the Dewdrop Doll characters. 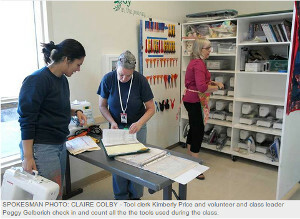 They contacted us recently, offering to donate kits for students in our prison quilting program to make as gifts. While we’re not able to use the kits in our classes, we’re happy to report that the company donated 35 kits to the Coffee Creek Correctional Facility Head Start program. CCCF’s Head Start classes bring incarcerated women together with their children twice weekly, giving the moms an opportunity to bond with their preschool age kids and to prepare themselves for parenting after release from prison. 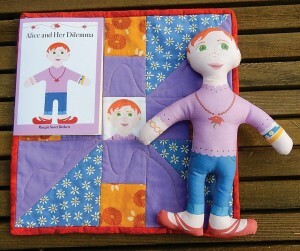 Each Dewdrop Dolls & Stories kit comes with a story book that teaches a good character trait, fabric printed with the front and back of a doll to go with the story, two squares of the doll’s face to incorporate into a doll quilt, and instructions on how to sew and stuff the doll and make the quilt. Please visit the Dewdrop Dolls & Stories website to learn more about their products. CCQ was featured in a Wilsonville Spokesman newspaper article this week. “Two for you and one for me” tells how our program, started 14 years ago by Koko Sutton, has grown from a small experiment to a successful program that teaches life skills along with quilting to women incarcerated at Coffee Creek Correctional Facility. The article’s title references the fact that each student makes three quilts. Two are donated to various organizations including Emanuel Hospital, Good Samaritan Hospital, Providence St. Vincent Medical Center, Meridian Park Hospital, Providence Elder Place, Salud Medical Center, and Camp Erin. Students keep their third quilt, or give it to a loved one. The Spokesman article offers a peak inside our Tuesday morning class, including pictures and interviews with students and instructors. “Thank you for your time and for believing in me,” one student said. “This is two hours a week that they feel like they’re regular people. That’s special,” said lead instructor Peggy Gelbrich. On December 23rd Portland TV station KATU broadcast a story about a choir for women incarcerated at Coffee Creek Correctional Facility. The choir program’s goal is similar to ours — to teach a life-enhancing skill that will improve the women’s chance of a successful return to society after leaving prison. We invite you to watch the video on KATU’s website.